Projects like these, where resilience is central to their design and construction, are becoming more commonplace. On July 28, the New Jersey Department of Environmental Protection awarded AECOM and a team that includes OMA, Magnusson Klemencic Associates, and Matrix New World Engineering the final design contract for a resilience project along the Hudson River. The primary goal is to reduce flooding in Hoboken, which has 2.3 miles of coastal exposure, and parts of Weehawken and Jersey City. Resist, through a combination of hard infrastructure like bulkheads and floodwalls, and soft landscaping like berms that might double as parks. Delay, through policy changes and infrastructure that slow stormwater runoff. Store, with green and gray infrastructure improvements, such as bioretention basins and swales, to capture stormwater. Discharge, by enhancing stormwater management systems and upgrading infrastructure such as sewer lines. Skidmore, Owings & Merrill, which is working on a separate project to redevelop Hoboken’s Terminal and Rail Yard into a mixed-use transit-oriented community with more than $100 million in improvements, is coordinating its efforts with the Rebuild by Design team, whose study area encompasses the terminal/rail yard. Projects like these, where resilience is central to their design and construction, are becoming more commonplace, as developers and their AEC teams adopt positive measures to give their property assets a fighting chance of surviving the ravages of natural disasters, and to minimize recovery costs. The replacement Ocosta Elementary School in Westport, Wash., which opened in the fall of 2016, offers a safe haven of refuge to students and residents who would have less than 30 minutes to evacuate in the event of a tsunami. The 23-classroom school includes the first vertical shelter in North America, a rooftop evacuation platform 53 feet above sea level that’s accessible via four flanking stair towers enclosed in concrete. The platform, which is anchored by concrete piles that extend 55 feet into the ground, can hold more than 1,000 people and withstand a 9.2-magnitude earthquake and the impact of incoming waves. Resilience accounted for $2 million of the school’s $16 million project cost. Three-thousand miles to the east, a seven-acre site with 1,700 lineal feet of shoreline along East Boston’s waterfront is being transformed into Clippership Wharf, a mixed-used development that will have 478 apartment units on two finger piers. Owner/developer Lendlease took over this project from a previous developer that had planned for lots of surface and underground parking. “That’s just not right for this day and age,” says Nick Iselin, Leadlease’s General Manager of Development. Lendlease rewrote the plan with several resilience measures, including replacing old seawalls that had been part of the site’s industrial infrastructure. Lendlease is converting one of the piers into a “living shoreline” by creating a series of terraces for new salt marshes and a habitat for Boston Harbor, which is subject to a 10-foot tidal influence. The first floor of each building will be 24 feet above Boston City Base. All infrastructure and mechanical systems will be located above the 100-year flood level. Garage levels will be flood resistant. To meet Boston’s “Living with Water” ordinance, Lendlease created a 1,400-foot Harbor Walk that will be 14-16 feet above the water level. In all, Clippership Wharf will have 189,830 sf of open space. Back on the West Coast, there’s a 28-acre parking lot south of AT&T Park, where the San Francisco Giants play, that is subject to sea levels that vary as much as 24 inches. Predictions estimate those levels could rise to 66 inches by 2100. 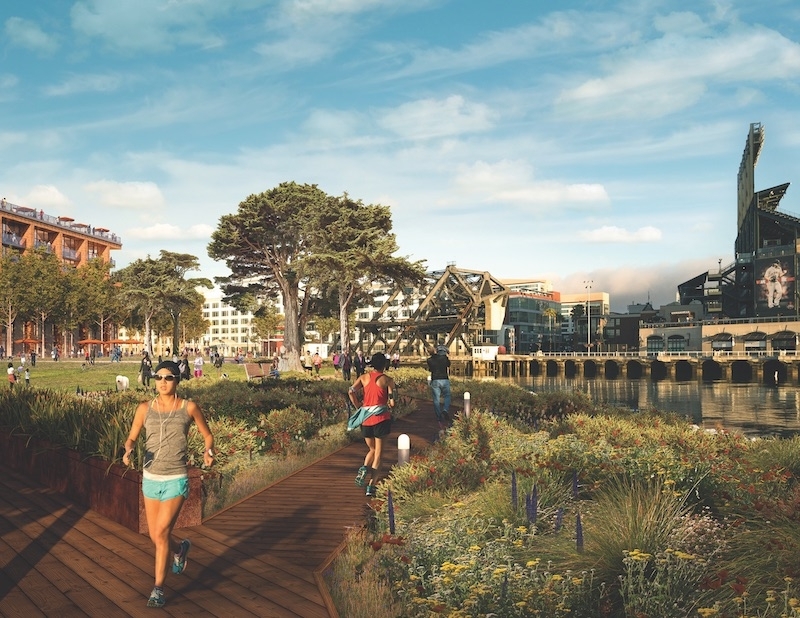 “We needed to manage that risk,” says Kristen Hall, LEED AP, Senior Urban Designer with Perkins+Will, which has written the design controls for the proposed mixed-used redevelopment of this waterfront site, called Mission Rock. Eventually, it will encompass 11 city blocks and include eight acres of parkland, 1,500 rental units, and a million sf of office space. The Giants and the Port of San Francisco are co-developers. The design, Hall explains, calls for the creation of a mesa down the middle of the site, with minimal frontages that may flood. She calls these frontages the site’s “sacrificial edges.” Other edges will include loading docks that create redundant elevated building access, as the majority of Mission Rock’s buildings would be at higher elevations. The park area would use a series of grade changes as design features, such as an amphitheater, a sloped lawn, steps, and ramps. In July, the first phase of the Cornell Tech applied science campus was completed on Roosevelt Island in New York City’s East River. That phase includes The House, a residential complex with 350 apartments for staff and faculty, and Bloomberg Center, a four-story, academic building. The buildout of this 12.4-acre, $2 billion campus is expected to proceed through 2043 and expand to two million sf. SOM, in collaboration with Cornell University and Technion – Israel Institute of Technology, is the project’s master planner. Resilience is key to protecting this property. Colin Koop, AIA, SOM’s Design Director, explains that the East River is a tidal estuary, and significant portions of the site lie within 100- and 500-year floodplains. So all of the architecture needs to be elevated. The main pedestrian walkway, called Techwalk, will allow people to enter the campus at its periphery and then rise gently through its open spaces at a slope that is largely imperceptible. Once they reach the central ridge, they would be surrounded by permeable façades “that help create a synergy between inside and outside spaces on campus,” he says.